The ships hired by the governments for exchange operations had served as luxury liners in the upcoming cruise business before World War II. The ships offered a passenger capacity between 600 to more than 2000 passengers. Some of these ocean liners gained a metaphoric value as repatriation ships – e.g. the Swedish MS Gripsholm. The Japanese ship Teia Maru stands for a less known, complex historical background. The ship served as exchange ship in 1943 and was sunk by an US submarine in 1944. Originally, the ship was a French Cruiser, sailing under the name of MS Aramis. The ship was converted into an armed commercial ship and seized in Vietnam by the Japanese forces. 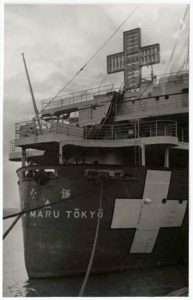 Renamed as Teia Maru, the ship with unusually shaped chimneys served as exchange ship in 1943. In October of the same year, the ship arrived the Portuguese port of Mormugao in the neighborhood of Goa to meet the MS Gripsholm, coming from the Americas. The exchange of the passengers filled the Asian and the Western newspapers, both eager to quote the latest news from the respective theaters of war. Photographs of this ship with an illuminated Red Cross at the top circulated globally thorough Western and Asian media. During World War II, exchange operations involved a considerable number of agencies. The coordination of these multiple actors transformed the «good offices» into a tool that went beyond the diplomatic services offered by neutral states. In the Swiss case, the exchange operations connected diplomatic services with relief activities of the ICRC. In addition, exchange ships addressed the limits and grey zones of the contemporary rules of international law in a paradigmatic way. On board of the ships, the representatives of a civil society intertwined with diplomatic personnel, from military attachés to consular staff. The spheres of activity, carefully separated by diplomatic rules until now, constantly overlapped. . Both sides of the warring parties brought their attention to the categorization of the passengers of the ships. All these categories, however, overlapped: On the one hand, the category of diplomatic personnel would encompass the Chinese gardeners and cooks. On the other hand, the civilians raised suspicions just because of their profession or knowledge, for instance when they provided expertise of possible military use. Therefore, the warring parties tried to avoid that passengers on exchange ships turned into sources of information about the enemy country they had left. At the same time, both axis and allied powers established meticulous interrogations of their own «returning» citizens to gain information of military relevance. In this highly nervous and volatile atmosphere, the expectations towards the «good offices» went far beyond the usual representation of enemy states. Instead of bilateral operations, Swiss representatives worked on a global level. Exchange ships stopped in almost every port with foreign residences within the Japanese occupied territories. The community on board therefore mirrored almost every sort of broken, redirected, and destroyed biography and exemplified the dark side of the twentieth century. In this social context, the European theatre of war was equally present in the Pacific: Exchange ships hosted diplomats representing one of the many exile governments in London. The Swiss representative hoped for a quick stay in Vietnam ruled by Vichy France, since representatives of De Gaulle’s Free France movement came on board. Jewish families struggled with passport issues. The same did the many individuals stranded in Shanghai after a long journey from Western Europe through Siberia or from Syria and Egypt. American missionaries from China met with Latin American representatives from Manchukuo and Korea. The Swiss representatives on board guaranteed for the correctness of the passengers’ list, and had to persuade the diplomatic representatives to give their cameras and papers in the Swiss custody. In addition, many of the passengers needed financial support. The many small sums paid to passengers were part of an extended and complex global flow of money whose administration by Swiss representatives touched questions of crucial relevance such as the ratio between US dollar and the value of «military yen» introduced by force in the occupied territories. The reconstruction of exchange operations sheds light on a missing part in the history of the Pacific War and the role of Switzerland, and thereby contributes to new perspectives on a global history of World War II. In addition, through the lens of activities of good offices’, the Swiss practices of mediation provides insights into the development of global expertise within a small export oriented country with a rather small diplomatic apparatus. This ongoing research project will therefore fleshing out the specific personnel and structural background within the Swiss system. Our investigations explore, for the first time, how the specific use of transcultural expertise gained by long lasting commercial contacts shaped and developed the Swiss characteristic as a global nation. This entry was posted in Actualités / News and tagged Humanitarianism, Second World War by Fabian Klose. Bookmark the permalink.